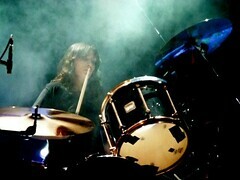 dharma69 from official band website forum have shared with us her great review of the Global Green USA Pre-Oscar Party. And in advance of the 83rd Academy Awards was Global Green USA’s 8th Annual Pre-Oscar Party at the Avalon where the greenest celebrities gathered to mingle, drink (organic cocktails), and support the cause to keep the world from imploding upon itself, and rock to the tunes supplied by the bands of the eve: Best Coast, Portugal. 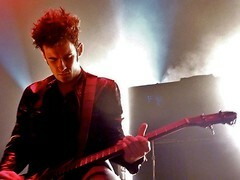 The Man, and Black Rebel Motorcycle Club. More often than not, buzz is overrated. See Best Coast for further. Moving on. None to soon, Wasila, Alaska’s own prog/stoner-rock specialists with a natural affinity for high vocal registers and the environment, Portugal. The Man, stepped up and alleviated my musical annoyance but quick. Opening with a tripped-out, groove stepping, fuzz heavy “My Mind”, Portugal. The Man made fast work of moving the crowd from amateur hour to a professional rock show. Seven songs that felt like 12 (their penchant for the jam may get lost on some but not on me), PTM’s set was lockjaw tight and a block of instruction in the art of musicianship and inspiration. Want a PTM related tweet? FACT: Portugal. The Man are “notorious” for cranking out one album per year since 2006 (actually they released two albums in 2009, those crazy Alaskans). Matter of fact, I pulled out on PTM’s 2009 “The Satanic Satanist” to listen to while writing this. 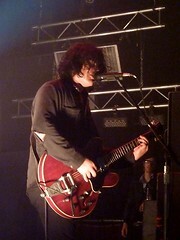 Of course, headlining the night was LA’s own Black Rebel Motorcycle Club. BRMC and a pre-Oscar party…alrighty. Next to Jordan Cook at The Viper Room this Sunday I’d been looking forward to this show above all for a few reasons, (no, not because I’m extremely bitter about Vegas), the most obvious one being that I’m really fond of their music. Also, a friend and long-time BRMC fan came with me, was seeing them for the first time, and was pretty darned excited about it. Hell, we skipped filthy glam rock, exposed flesh and unspeakable naughtiness with Semi Precious Weapons at The Roxy/On The Rox for you, BRMC. Just saying. I tweeted that after Portugal. The Man, Black Rebel Motorcycle Club had better bring their ‘A’ game, which was like telling chocolate that it had better be tasty. BRMC always bring their game to a show and, also, have true care for things environmental, so suffice to say the crowd (celebs and average fans alike) was appropriately rocked by the trio’s blaringly loud and dense distortion, Leah Shapiro’s solid rhythms, Robert Been’s bass thicker than oil sludge, and Peter Hayes’ guitar wickedness. It was short (about an hour) but it was sweet, a replica of just about every BRMC show I’ve ever seen and in their lack of divergence is no criticism. They do what they do and how they do it because that’s how it should be done. Where music fans tend to reward the most outlandish and overtly annoying regardless of true skill, lack of pretense on Black Rebel Motorcycle Club's part is one of their most attractive features. Truth: I spend a good deal of a BRMC show with my eyes closed because I don’t need to see what Peter’s doing in order to feel the effect of his distortion pedal and I don’t need to see Robert point his damned bass at me to get the point. Hell, Leah could periodically be doing handstands on her bass drum for all I know; as long as I’m feeling her beat, we’re good. For the first two songs I could barely hear a word that was sung (Rob’s side of the stage is not kind to one’s eardrums), but it’s where I wound up along with the pure and faithful that no Los Angeles BRMC show would be complete without: Liane, Jodi, Paola, Mary, Dana, & Michele. The band labored through the thick of “666 Conducer” and “Ain’t No Easy Way” but the temperature seemed to change as the punch of “Spread Your Love” seemed to make some of the elite move their feet. I do have to say that my annoyance factor returned with a vengeance after “Shadow’s Keeper”. 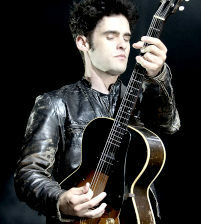 As the last song on the setlist, BRMC could have just left it as was and none in the room would have been the wiser, but instead Peter and Rob made their psychedelic transition into the delicate grace of “Open Invitation”. How fitting, appropriate as we “may never be here again” if we persist in abusing our Mother Earth. Beauty obviously does not equate with sense or intelligence because the beautiful ones in the room to the rear couldn’t seem to grasp that this was a moment to STFU. But hey, they played “Hi/Lo” and folks probably didn’t grasp that, either. Only in Hollywood -- and particularly during Oscar week -- could Black Rebel Motrocycle Club, Best CoastPortugal. the Man lay claim to having shared a stage with James Cameron, the director of 'Avatar' and 'Titanic.' All three bands came out to show support for the environment at Global Green's eighth-annual Pre-Oscar party. Cameron and wife Suzy Amis-Cameron, who came out to make a presentation on environmental fashion that featured an eco-friendly red-carpet design, left the rocking to the trio of guitar-heavy indie acts. The show kicked off with L.A. buzz band Best Coast, fronted by Bethany Cosentino, who brought their '60s-tinged melodies that just as easily segue into frenetic energy and seamless distortion. Following a wall of sound from Alaska's Portugal. the Man, headliners Black Rebel Motorcycle Club took the stage just before midnight. Despite the fact that many in the audience had left due to the late hour, BRMC delivered an hour-long howling mix of blues and rock. Among the highlights of their set were the title track of their latest album, 'Beat the Devil's Tattoo,' and a version of 'Spread Your Love' that had everyone in the place moving up to the front of the stage.